Visit to Duong Thi Thuy Huong's Home. This girl's full name is Duong Thi Thuy Huong. We met her at the second clinical examination at Binh Phuoc Traditional Medicine hospital on April 27, 2016. She is a victim of Agent Orange since her mom was a soldier at Military Zone 5. Huong was born in 1990 and weighed 3 kg at birth; she was immediately diagnosed with spastic cerebral palsy. When she was three years old, her family took her to the Peace Village in Binh Duong for a rehabilitation treatment program but it did not make any progress. She could speak at the age of 10; however, due to lack of appropriate treatment, now she hardly ever says a word. At the clinical examination, the therapists (OT and PT) provided her with several rehab programs. They also instructed her mom how to conduct these programs and take good care of her at home. After two months, a homevisit group was organized to come to her house for health and environment assessment purposes. The physiotherapist tested her skills again and noted that she was able to perform basic movements. For instance, she can move from the floor to the chair and reach things around with some encouragement from other people. She can even turn on her favorite music on the radio. That is why the therapist suggested that her family should spend time to create motivation for her to do activities of daily living, help her form good habits and socialize with neighbors. It is believed that if being taken care of in the right way, Huong will be more likely to show improvement and be more independent in life. This case will continue to be followed up by DIRECT’s technical staff. General John Vessey, former Chairman of the Joint Chiefs of Staff and Ca Tran. General John Vessey, former Chairman of the Joint Chiefs of Staff, passed away this week. In late 1991, I met him at the Pentagon to brief him on VNAH's effort to assist the war victims in the South of Vietnam. He was kind and gracious, among the early supporters of VNAH. We offer our deepest condolences to his family. Providing physical therapy services and technical training. Mr. Joakim Parker, USAID/Vietnam Mission Director speaks at the Conference to coordinate all disability programs being implemented in seven provinces. 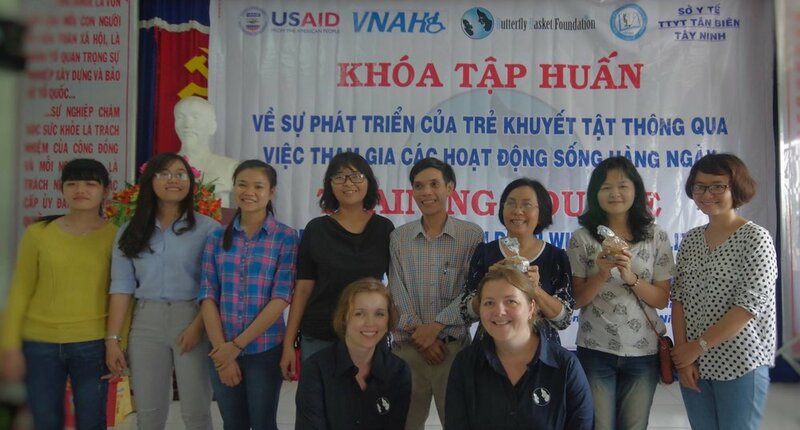 The new five-year disability cooperation program between Vietnamese Government and the United States Agency for International Development (USAID) was officially approved by the Prime Minister on 4th April 2016. The new program, funded by USAID, aims to expand opportunities for persons with disabilities through improvement of coordination and enforcement of the UN Convention on the Rights of Persons with Disabilities (CRPD) and disability legislation; delivery of physical, occupational and speech therapy services; and service system capacity strengthening. The program is implemented by six organizations including VNAH in cooperation with central and local partners and targeting 7 provinces including Thai Binh, Hue, Quang Nam, Tay Ninh, Binh Phuoc, Binh Dinh and Dong Nai.